ISN'T GAFFI CUTE? I DUPLICATED GAFFI, REDUCED THE SIZE TO LOOK LIKE A BABY AND FLIPPED IT TO FACE THE PARENT. THAT IS THE BEAUTY OF DIGITAL. 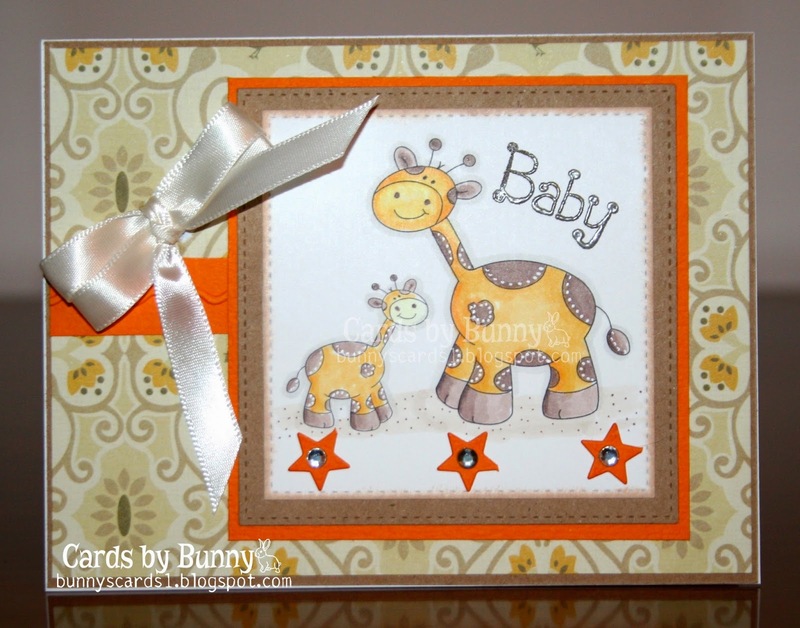 That giraffe is SO cute, an your card turned out AMAZING! Thanks so much for stopping by to share this super sweet card with us this week, Bunny. I'm always SO grateful to have you play along, and hope that you're having a wonderful week. Too cute! Thanks for sharing and joining us at Inspiration Destination. Hope to see you again and good luck! Oh this really is darling! I adore the giraffes and such a lovely design too! Lovely card with a sweet image. Super cute. Thank you so much for joining us at Craft Your Passion challenge. Oh I soooo love your card Bunny !! Great image and colours. Super sweet. Thanks for sharing it with us at Inspiration Destination. Good luck. Precious card! Just love digis ... Thanks for sharing your talent again with us at Cuttlebug Mania. This is such a cute, cute card! I love it! Thanks so much for joining our challenge at Lil Patch of Crafty Friends!! Good Luck! Bunny this is a wonderful creation with great attention to detail and perfect for our ‘ANYTHING GOES’ challenge. Such cute little critters too. Thanks for sharing your talent with us. Good luck.